To mark the 20th anniversary of the Czech-German Declaration, the Czech-German Fund for the Future for the Future and the Czech-German Discussion Forum commissioned a comparative public opinion survey to examine how the two countries perceive each other. The survey was conducted by the STEM non-profit institute in the Czech Republic and the Institut für Demoskopie Allensbach for public opinion research in Germany. The STEM survey was conducted on a representative sample of the Czech population aged 16 and over from 30 November to 12 December 2016. Respondents were selected using a quota sampling method, with some 1,039 people taking part in the survey. The IfD Allensbach survey was conducted on a representative sample of the German population aged 16 and over from 1 December to 15 December 2016. Some 1,459 respondents took part in the survey. The following press release looks at issues related to Czech-German relations. In their assessment of relations between the Czech Republic and Germany, Germans are considerably more reserved; they do not pay as much attention as the Czechs to the issue of Czech-German relations. Two-fifths of Germans consider relations between the two countries to be good. Germans from the former East Germany and from neighbouring Bavaria and Saxony rate mutual relations more positively than those from other regions. Four-fifths of Czechs consider relations between the two countries to be good. Interest in events and developments in the neighbouring country plays a crucial role in the public perception of mutual relations. Three-fifths of Germans who are interested in what is happening in the Czech Republic and almost 90% of Czechs who are interested in what is happening in Germany favourably rate relations between the two countries. Besides interest in the other country, another significant factor which influences public attitudes towards mutual relations is the role of tourism and travel and personal knowledge of the inhabitants of the neighboring country. 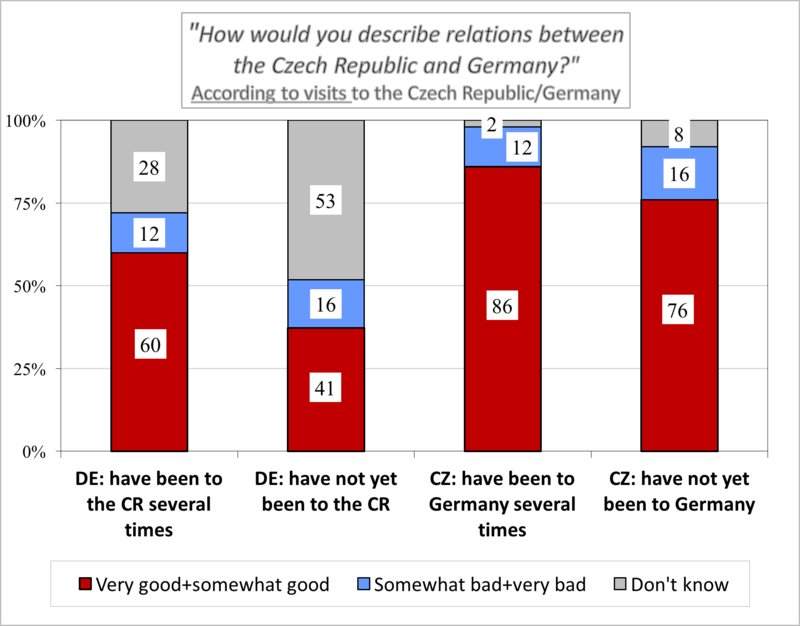 The majority of Germans, who have visited the Czech Republic several times, rate relations between the two countries favourably. Almost 70 % of Germans who have several Czech acquaintances consider relations to be good. Travel to Germany and personal relationships with Germans has a positive impact on mutual relations, also in the case of the Czechs. Respondents in the two countries were given a list of nine statements describing the characteristics of the other country. Their task was to select those statements which best characterised the neighbouring country, whereby they were permitted to choose as many statements as they wished. At first glance, the results show different points of departure in the assessment of the two countries. Germany is portrayed in the eyes of the Czechs as an important and modern country with a high standard of living. The Germans see the Czech Republic as an interesting tourist destination and a hospitable country which is also suitable for economic cooperation. Despite the different approach of the two countries to migration policy, it is interesting that only a quarter of Czechs regard Germany as an outward-looking country. One-fifth of Germans consider the Czech Republic as such. Their high standard of living easily takes first place among the characteristics which best portray the Germans, primarily in the opinion of Czechs from the border regions. Half of Czech citizens are in no doubt whatsoever that Germany is a modern country and, even more so, with regard to Germany’s influence, irrespective of where they live in relation to the border. 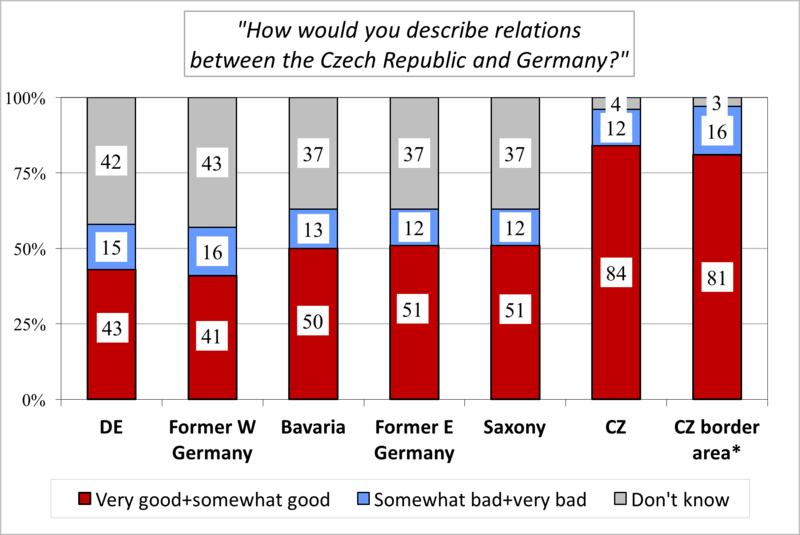 Although citizens of former East Germany are considerably more likely to attribute the characteristic “modern country” to the Czech Republic than those of the former federal republic, less than two-fifths do so. Those who believe the Czechs to be hospitable are predominantly citizens of the former East Germany. Respondents from the eastern part of the country also most frequently consider the Czech Republic to be an attractive tourist destination. Significantly fewer citizens from the western federal states are likely to characterise the Czech Republic as hospitable, and even fewer consider it to be an interesting tourist destination. Czechs are least likely to select ‘an interesting tourist destination’ and ‘hospitality” to characterise Germany. This is true for the entire population, not only for those in the border regions. Germans more frequently attributed distinct national pride to Czechs than Czechs to Germans, primarily Germans from the eastern federal states (at over fifty percent).